Seconds into the opening credits, a petite elderly woman leaned over to her son and whispered, “He’s getting a little bit too old for this!” Those were my sentiments exactly when finding out that California’s former Governor, Arnold Schwarzenegger, was in yet another movie. If you saw the Terminator’s last performance in Escape Plan (2013), you might have lost all hope. 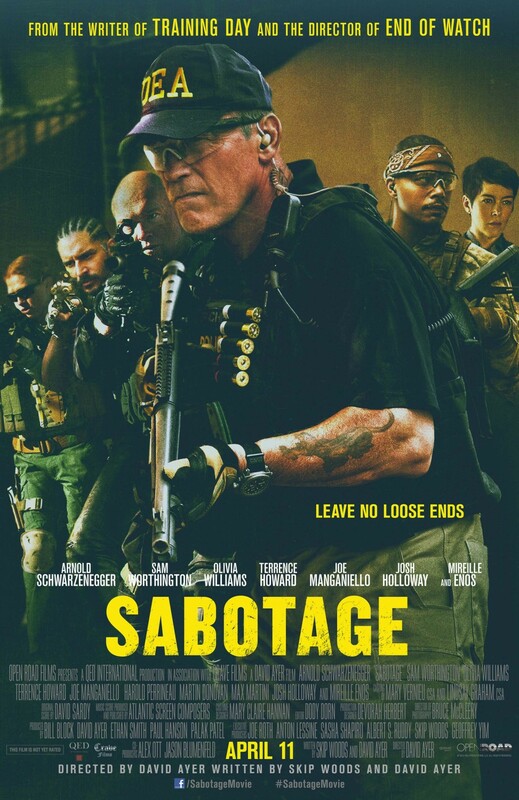 But a quick redemption is in order with Open Road Films’ “Sabotage.” Schwarzenegger might be old, difficult to understand, and slightly delayed since his body building days, but he was tolerable in this movie. As John ‘Breacher’ Wharton, the 66-year-old leads a highly-capable Drug Enforcement Agency special operative team into dangerous waters to capture drug cartel top officials. When an internal money laundering scheme backfires, it is up to Breacher to find the person who is responsible for killing his DEA team members one-by-one. The movie stars Sam Worthington, Olivia Williams, Mireille Enos, Terrence Howard, and Joe Manganiello. The foul language was abundantly present in “Sabotage.” This special DEA team is filled with “f—“ word slinging tough guys (and a girl), not to mention the nasty, sexual references. Now, “Wolf of Wall Street” used the “f—“ word 506 times, and “Sabotage” is not that bad. But the movie also was not 3 hours long either. For 109 minutes, there is a lot of profanity to endure. And unlike other meticulous movie critics, I did not have the patience to count every swearing instance. Writer and Director David Ayer brought some of his similar techniques for this film. The gruesomeness and vulgarity of the storyline are similar to the works of “Training Day” (2001) and End of Watch (2012). Ayer’s use of dark thematic scenes or boldness of capturing a city in its most popular element is what sets his movies apart from the rest. You immediately recognize the rural and urban grounds of Atlanta because Ayer uses those landmarks to encapsulate significant scenes. Bad-boy Terrence Howard and sweetheart Harold Perrineau have officially participated in their third movie together. Other than “Sabotage,” the pair starred in the Best Man (1999) and the Best Man Holiday (2013) where they played best friends, Quentin and Julian. The actors were not on the same playing fields in this movie though. Howard plays “Sugar”, a hot headed undercover DEA agent, whereas his buddy, Perrineau, plays Atlanta homicide Investigator Jackson. 2.5 Stars: Arnold Schwarzenegger’s career has come with a sense of maturity. Eventually he’ll have to stop physically fighting the bad guys and find some “Grumpy Old Men” roles. (Sylvester Stallone too) Taking the good with the bad, Arnold Schwarzenegger did not look as long winded as I thought he would.